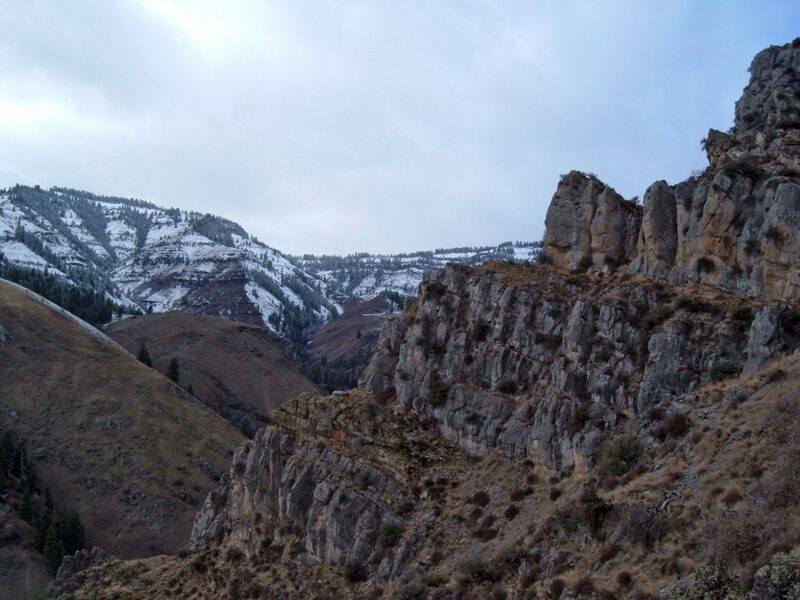 I planned an overnight trip to Hells Canyon, in the northeast corner of Oregon. 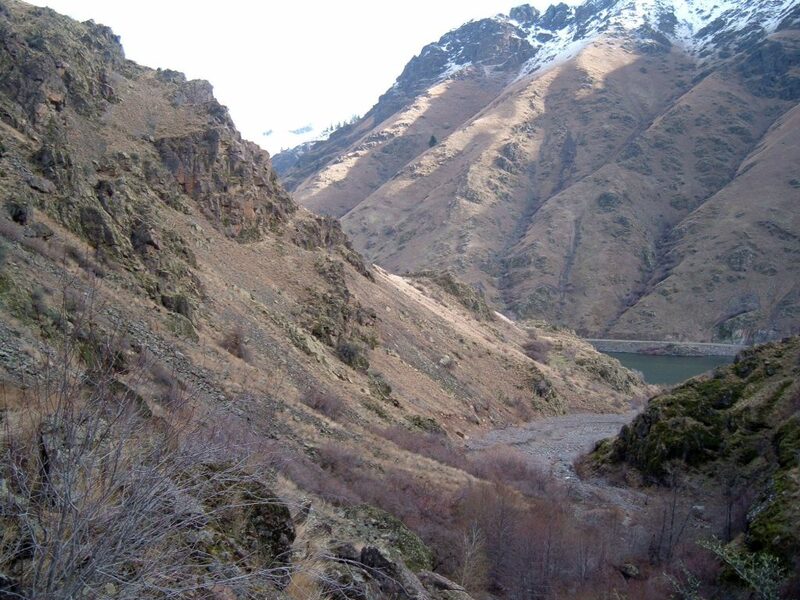 Much of the area is inaccessible due to snow, so my starting point was the Hells Canyon Reservoir TH, at about 1700 ft. My goal was to find McGraw Cabin by following the Reservoir trail 2 miles to the junction with Old McGraw Creek Route, which is now mostly destroyed and impossible to follow. I figured it would be easy enough to navigate just 2 more miles to the cabin, located right there, near the creek. Of course, I forgot the golden rule of hiking, which is: Nothing is “just” that simple and if something looks like it’s “right there”, it really isn’t. I carried enough food and gear to last several nights, in case I decided to stay longer. Weather reports looked grim, so I was prepared for cold, rain and snow. All I had for navigation was a sketch map from a guidebook and a detailed description of the route. I set out along the Snake River, beginning a little before 10 am on a beautiful Thanksgiving morning. I’m not used to carrying a heavy pack so every step felt like death. After the first half mile or so, the weight seemed to ease up and I became more comfortable moving along the trail. After 45 minutes I reached the mouth of McGraw Creek. I crossed the debris and picked up the old trail at the other side of the canyon. After a few tenths of a mile, the bushwhack begins. Although my guidebook had described the route perfectly up to this point, it now left me with “the January 1, 1997 waterspout obliterated most of the trail for the next 1.2 miles. If you continue your hike through this very rough area you will be able to climb out of the north side of the creekbed for the last time about 1.6 miles from the junction…” Great, I have 1.2 miles to figure out for myself. Orienting myself was easy, since the creek was at the base of the canyon, the main canyon and the Snake River were behind me, and I knew the cabin would be on the northern wall on my right hand side, just up ahead. Getting lost was not an issue. But after about an hour of picking my way along the streambed I got really frustrated and decided to head up the canyon wall. I knew I needed to gain some elevation, and climbing looked far more interesting than navigating slimy pebbles. So I ascended. Along the way, I traversed some sketchy talus slopes, dislodged my fair share of rocks and mud, and came across some interesting shells and bones. Although the top never seemed to get any closer, I had made it about halfway up the canyon and soaked in some amazing views. At one point, however, I realized that the higher I climbed, the more I’d have to descend, since I obviously hadn’t gone far enough into the canyon to reach the cabin. Climbing was the easy part; going down looked scary as hell. I tossed down my pack atop one of the slanted rock ledges and scrambled up a bit to get a better view. It looked like more of the same for miles and miles. Suddenly it occurred to me, however, that if I was a homesteader looking to build a cabin, wouldn’t I find a flat spot close to the stream? Duh, I wasn’t going to find a cabin up here. I’d have to keep moving forward along the stream and be on the lookout for flat, grassy terrain. Although I’d been moving for hours, I was traveling extraordinarily slowly, and I probably wasn’t even a mile into the canyon when I’d taken my little detour. 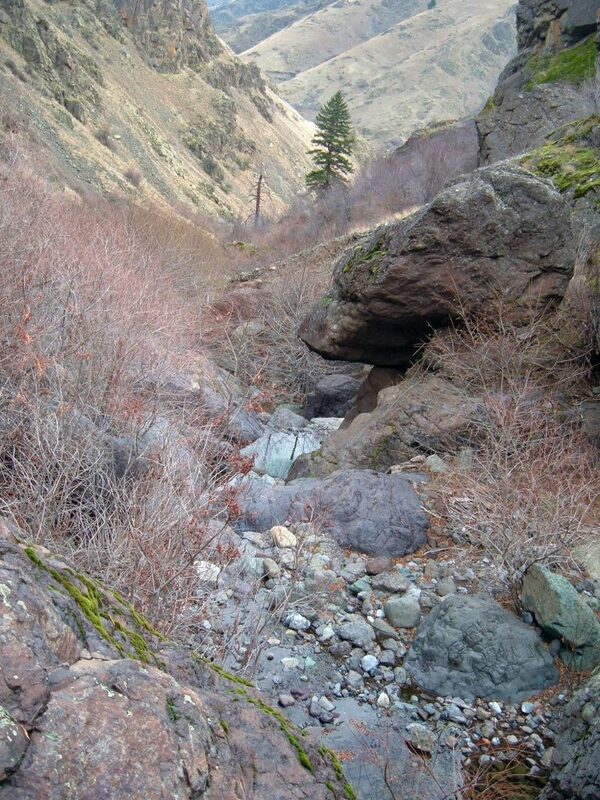 Patience, I decided was key, and I carefully made my way back down the crumbly rock slopes to the creekbed. Amazingly, not far up the creek I came across a Wilderness sign and regained the old trail for a couple of yards before it became washed out again. Moving slowly, I proceeded on, stopping to investigate interesting looking rocks and following countless animal paths. One of these such paths seemed to lead up a gentle, grassy slope, which I decided would be my last hoorah. If I couldn’t see the cabin from the top of this hill, I’d make camp somewhere and figure out a plan for tomorrow. Climbing that tiny hill was excruciating. Once at the top, I looked all around for some sign of the cabin. Nothing. How could I have failed so miserably? I noticed a distinct path crossing the hilltop and disappearing in the distance. I assumed it was another elk highway, since I’d followed so many of them today. There was much more evidence of wildlife here than of humans. 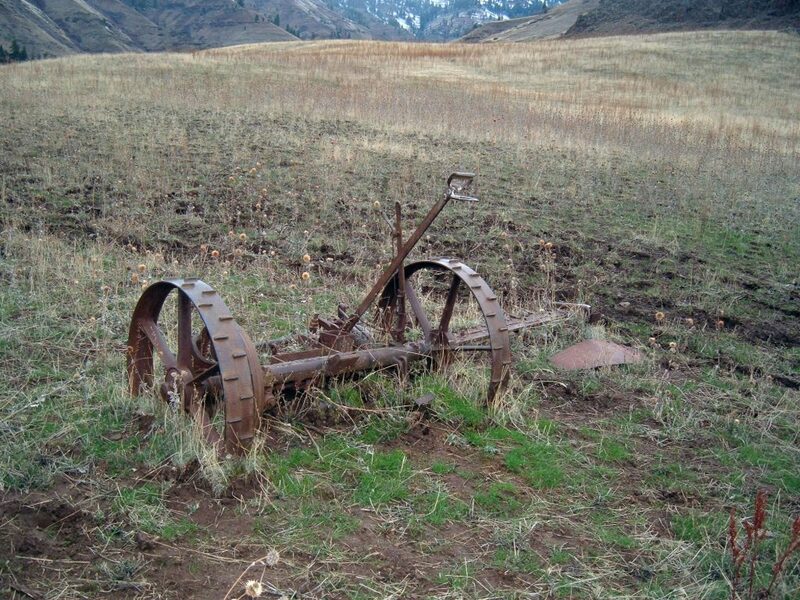 But upon closer investigation I noticed that along this path was an old piece of machinery…a mower? Like the one described in the guidebook? Bingo. I’d found a way to the cabin. I followed the deep muck on this well-traveled pathway, my boots picking up pounds of mud with each step, until at last I caught a glimpse of my destination. 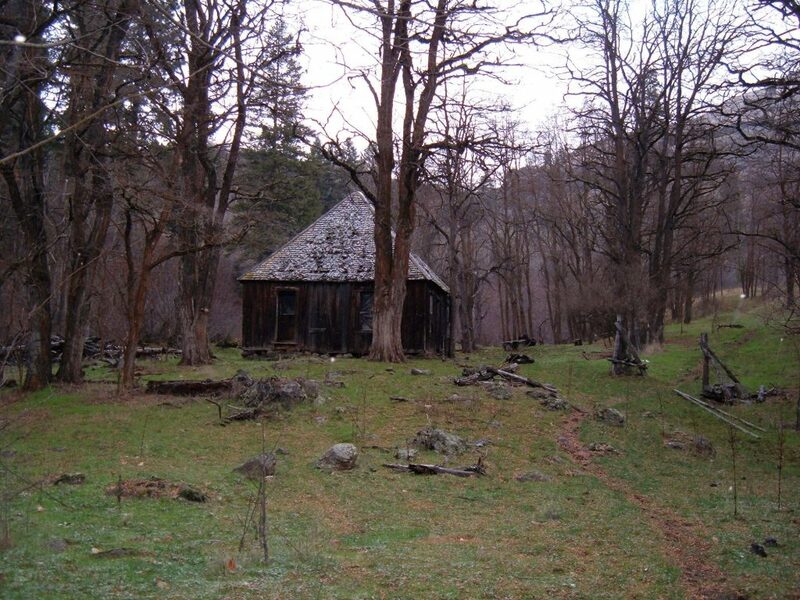 The cabin is in a deteriorated state, just off a gently rushing portion of the McGraw Creek. A barbed wire fence stands between the cabin and the trail but it doesn’t enclose the entire area so its purpose is unclear. Bits of plastic and other human trash are scattered about the area, so apparently it’s not as difficult to find as I’d first thought. 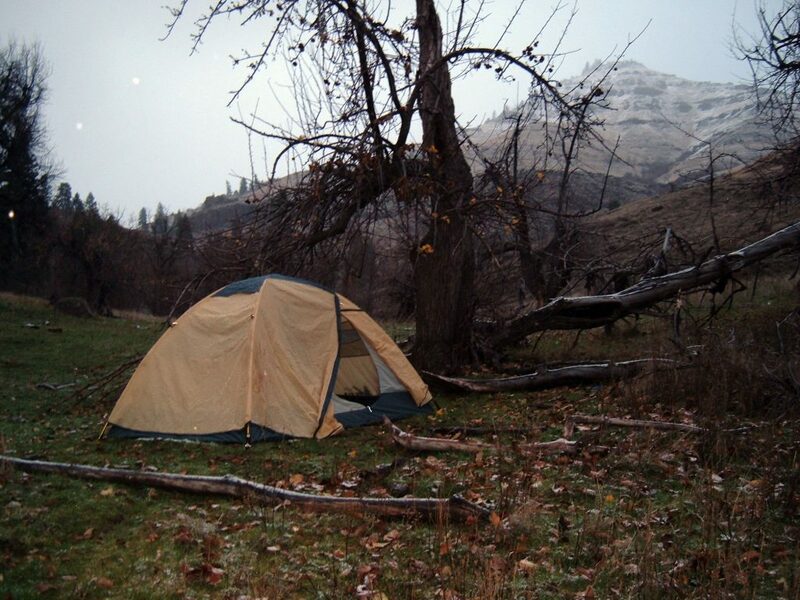 I set up my tent just up the trail from the cabin, in a flat area close to some trees and the creek. It was about 3:30pm. I’d borrowed the tent and some other gear from a friend, so it took some time to get the tent and rainfly assembled properly. I got myself situated and comfortable, then attempted to get the stove going. The stove was also a borrowed item, and I could not for the life of me get it to work. After about 30 minutes of fighting with it, I ended up with a leaking can of fuel and no way to attach the canister to the stove. I set the fuel can away from the tent, tossed the stove aside, and munched on cold food for dinner. A cheese sandwich, sliced deli turkey, and cold water. Happy Thanksgiving. The darkness swept in while I was engaged in combat with the stove, so I quickly set up my bedding and cozied up in my down bag. Ready for bed, I checked my watch. It was only 6pm. Goodnight! The next morning, I awoke to light snowfall and temperatures just above freezing. I was warm and comfortable all night, and it looked like I wouldn’t have to battle cold today either. I packed up and took off at 8 am across the grassy bench, hoping to descend the same way I came up, on that rolling hillside. Of course, I picked the wrong way to go down and reached a fairly sheer drop that I didn’t want to take chances with. I climbed back up to the bench and found another, more tame way down.Once back at the creek, I attempted to follow the path of least resistance, which turned out to be much harder than I thought. I’d avoided much of the creek during my canyon wall detour yesterday, so I didn’t realize how difficult the return trip would be. I was cut up by thorns and branches, lost my balance several times on smooth, mossy rocks, and angrily fumbled around obstacles like huge trees, water cascading into deep pools, and steep drops in the landscape. Several times I announced victory to the canyon… “You win!! What do you want from me? Can I get one freebie step, please?” Every move was complicated. My pack got caught on everything and threw off my center of balance. I had no way to tell how far I’d gone, so it was easy to get discouraged. All that work was producing lots of heat and at one point I just had to stop and de-layer. As I was changing out of my fleece pants I looked ahead and thought, “No way, there’s the Snake River!” I blinked, looked again, and decided I was losing it. I hadn’t gotten that far yet, all I was seeing was another twist in the canyon. Keep pressing on and hang in there, I’ll see it soon. Shortly after that wardrobe adjustment, I looked up again and confirmed that I was, in fact, staring at the Snake River. Finally, the end of this godforsaken canyon was in sight. Overjoyed, I continued along the bank of the creek, caught up with the old trail, and made my way back to the easily traveled Hells Canyon Reservoir Trail. Today, it took me only 3 hours to travel the 2(+) miles from the cabin to the Snake River as opposed to 4.75 hours it took yesterday. Each trip into the backcountry, on or off trail, is a great learning experience. Although the traveling was very rough at times I had a fantastic journey, saw lots of unique things, and expressed a big part of myself that must remain dormant in the daily 9-5 lifestyle. Would I trek back along this route to the cabin? Absolutely not, but would I go back to Hells Canyon? Yessir. There’s much to be seen there. More research, better maps, and perhaps a willing companion would make another trip to the area very worthwhile. This entry was posted in General, Hiking, Idaho, Oregon and tagged hike366 on November 25, 2006 by Jess B.